I don’t think I mentioned that I bit the bullet and purchased a serger. I decided on the Brother 1034D because it got a lot of positive reviews and the price was decent. I figured at $185 (which is what I got mine for) if it didn’t work in a few years I was still going to get my money’s worth. To start practicing, I decided to make a basic skirt as my first project. 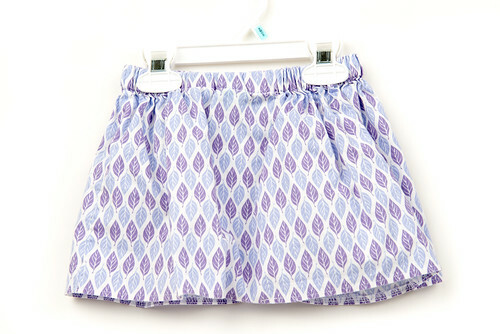 Seriously, a basic skirt is something you must try if you have a little girl in your life. All you need is her measurements and the skirt can be done in less than an hour. 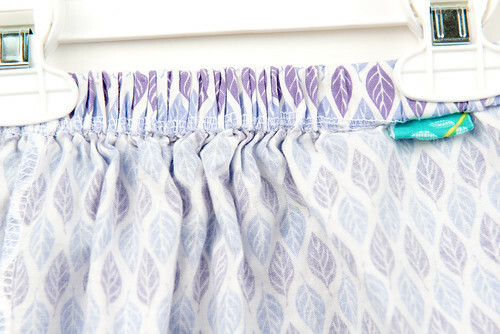 Actually, with the serger, I think I finished this skirt in 15 minutes! That included picking out the fabric all the way to finishing the hem. I took a few detail pics (actually, my husband took these with my guidance of what pics I wanted) so that I could show you the serged edges. I really think it makes the skirt look more professional. You can click on an image so that you are able to zoom in on the serged parts. When doing the elastic waistband, I left the serged edge showing, but you could easily still hide it like I show in my tutorial. Lillian hasn’t complained about it being scratchy and she has worn it plenty, so I will probably use this way again. Folding the edges is what takes the longest when making this skirt, so a decent amount of time is saved by serging. 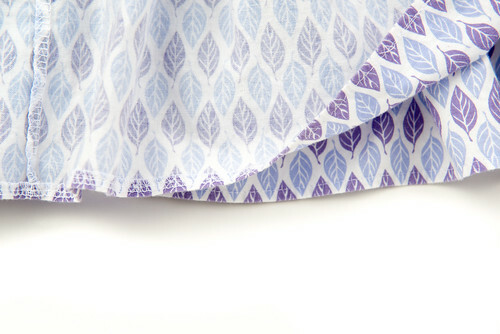 Here is the hem….I serged the bottom edge and because it’s about a 1/4” I just ironed the bottom up with wrong sides facing, so that the serged edge no longer showed on the right side of the fabric and then did a normal stitch around the bottom. 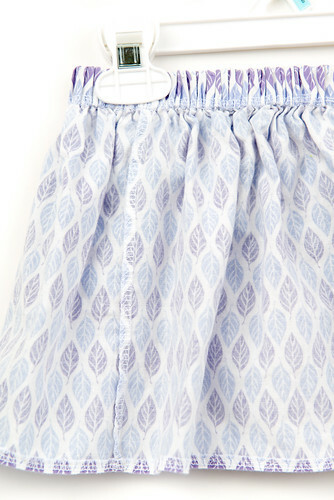 Here is a picture that shows the inside and the outside of the skirt. 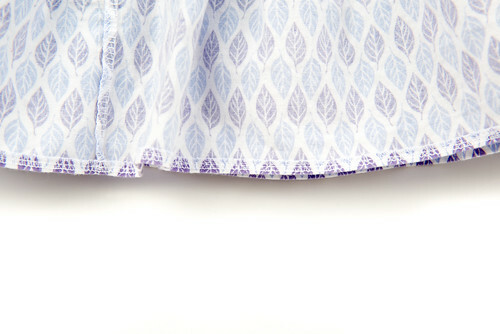 As you can see, the serged edge does not show on the outside of the skirt, but it still has a nice finished hem. I have a board on pinterest for sergers if you want a few tips. So far, I really like having a serger. My sewing space doesn’t have the best set up so it’s annoying to use right now, but that is only because I have to move my sewing machine so I can use the serger, and then move the serger so I can use the sewing machine. Once our basement is finished, I will have my own sewing space though! I can’t wait! Pingback: Winter Pajamas Sewing Novice | Sewing Novice - A beginner's resource for learning to sew.